As you may already be aware we are official distributors for all Koyorad Performance Aluminium Radiators and have access to the entire product range. We hold a large selection of there applications on site and have acces to the Koyorad Europe warehouse also. We have reviewed the whole price list and have reduced all the prices to bring them more into line with the competition because we feel the quality of these radiators is second to none and shouldnt be missed out on. Koyorad is a Japanese company established in July of 1956 as Ejiri Radiator in Nagoya, Japan (Aichi Prefecture) as a radiator repair shop. Twelve years later in 1968, Ejiri Radiator established a radiator and oil cooler factory in Nagoya. We then separated our production facilities from our repair facilities and began manufacturing radiators. Two years later in 1970, Ejiri Radiator was renamed to Koyo Radiator Manufacturing and began expanding to branches all over Japan. Koyorad quickly developed into an industry leading Aftermarket Radiator Supplier worldwide. With over 57 years of radiator design and manufacturing experience, founder Mr. Ejiri and son soon gained interest in automotive racing. Officially launched in 1999 in Japan, Koyorad Racing Radiators soon made a presence in Japan’s ever popular racing scene. 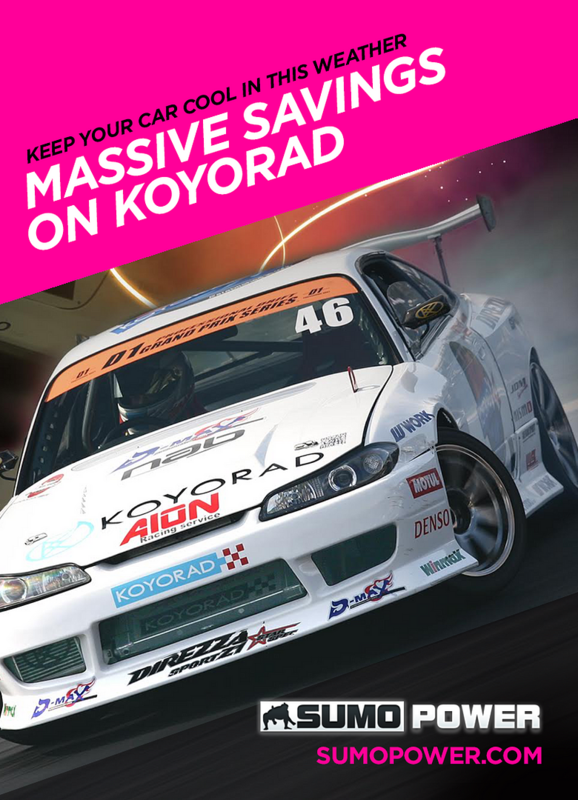 Koyorad Racing Radiators soon became synonymous with Koyo’s High Quality Aftermarket Radiators. As Koyorad Racing Radiators grew in reputation for quality and performance, so did the company’s desire to expand. In 2004, Koyorad Racing Radiators made it’s US debut. What started as a few racing applications for Japanese vehicles in 2004 has now grown to over 80 models for Japanese, US Domestic, and Korean vehicles. Construction under strict quality control and solid boxing result in tubes with optimal coolant flow and fins with highly efficient heat transfer. Tubes, Fins, Headers and Brackets are brazed in a state-of-the-art Nocolok furnace, bonding all components to resist damage from vibration, road debris, and the elements. Precision machined billet filler necks are incorporated on each Koyo radiator for strength, durability and better sealing. Koyo incorporates application specific mounting locations for all fan shrouds, inlet/outlet hoses and top/bottom mounting pins, ensuring quick and pain-free installs. Each Koyo All Aluminium Race Radiator is Heliarc welded individually by hand. This creates the strongest aluminium to aluminium bond, to mate all components. This is one of the best it not the best brand for quality performance Aluminium radiators. Koyorad performance Aluminium radiator options for your Subaru Impreza now more competitively priced and available for immediate delivery. High quality aluminium radiators that directly fit straight into your vehicle perfectly with no issues what so ever.